The story is pretty interesting, but at the same time the pacing was rather inconsistent. Sometimes, the story lurched forward, not unlike one of the zombies or skeletons reanimated by the antagonists. * The author’s prose is good, though, and descriptions are neither too sparse nor excessive. The characters are pretty interesting, but the book’s not long enough to properly flesh them out – as a result, certain moments of character-building felt half-baked or clunkily inserted into the narrative. 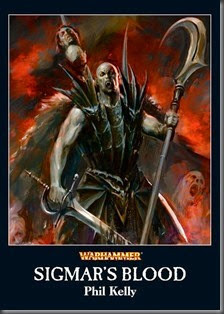 Sigmar’s Blood could have done with being longer, which would have allowed us to get to know the characters more, and smooth out the narrative issues. Nevertheless, it was enjoyable and quick read, laying down a few of the elements needed for the End Times. A group of holy men and women of many faiths – from the Grand Theogonist of the Empire-spanning Sigmarite church to the Fay Enchantress of Bretonnia – are being transported through the wilds of Sylvania in a sinister cage of living bone. At the head of their procession of the dead is Mannfred von Carstein, lord of that benighted realm. But where is he taking them, and to what end? As the prisoners decipher the vampire’s goal, they make a desperate attempt to escape and thwart the count’s plans – but treachery from within may see them undone. This short story, released only a couple of weeks ago, continues the story started in Sigmar’s Blood. It starts just shortly after the events (so I’m not going to delve into the plot). It’s short and punchy, but also throws in a mini-twist at the end, and some appropriately gribbly undead action and circumstances. Sometimes it feels like a who’s-who of new and scary beasties for the undead army, but this doesn’t upset the flow of the story. Is it essential reading for the End Times? 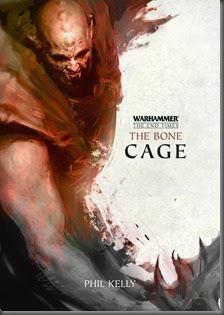 Probably not, but Bone Cage shows that Kelly has improved as an author. I’m looking forward to reading more by him. The next book in the End Times series is the newly-released The Return of Nagash by Josh Reynolds. I am very much looking forward to reading this – as I mentioned in the Upcoming post I wrote a little while back. It’s also encouraging that Black Library are bringing Warhammer back into the spotlight (even if it might be just a little bit), after a couple of years that have been dominated by new Warhammer 40,000 and the Horus Heresy fiction. Which reminds me, I do need to get around to Rob Sanders’s Archaon: Everchosen, and catch up on the latest Gotrek & Felix novels.